Store a sink-side essential in this handmade granite and stone stand. The subject was utterly absorbing: how to add an artful touch to a common kitchen cleaning aid. Decorative beach stones and a base cut from salvaged granite—connected by three aluminum posts that store your sponge—do just that. The durable rubber bottom pad protects your surfaces from scratches. This stylish holder also makes a great wallet valet, inviting cocktail napkin holder, or stylish mail caddy. Handmade by Arra David and Anne Johnson in Windham, New Hampshire. We took a road trip to visit Anne and Arra in New Hampshire, where they welcomed us with hard cider and put us straight to work. See the whole story on our blog. 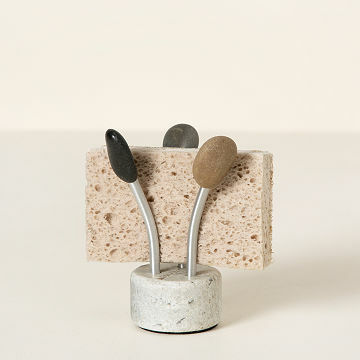 Make it a kitchen set, and pair the Sea Stone Splash Sponge Holder with our Sea Stone Spoon Rest. Due to the recycled and handmade nature of this item, each found beach stone is unique and granite color will vary. During lifetimes spent around New England's forests and seacoast, Arra David and Anne Johnson have become masters of bringing the outdoors in. Stone, sun, wind, rain, and waves provide their raw materials. Arra and Anne transform them into well-designed, innovative works of handmade art with the help of a group of dedicated artisans they lovingly call "rockers." "We work together as a closely knit family," says Arra. "We all put our hearts, brains, muscles, and fingertips into everything we build." They use ethically forested wood, and replace each stone gathered from the water with a quarry rock that will eventually become another worn beauty. Sponges now can be displayed in fashion!!! Simply set on the counter, insert wet sponge, it dries with NO mess and it looks great. Looks great on my new quartz countertop! Perfect and a unique sponge holder! I was admiring this for a long time. I took advantage of the shipping offer and paid for the year. Thanks Uncommon Goods! It would have been a great match for my kitchen as I have Sea Stone cabinet door handles - but the stones and base were all gray which made it unattractive. I am returning. Uncommon Goods couldn't provide one like the photo. The sponge holder adds a natural element to our kitchen. It is darker than the image, but that's okay. It is beautiful and does it's job. We are very happy with this purchase. Do not hesitate to purchase this! Beautiful and Functional - Worth the $! I have always hated having the dish sponge either damp in the sink or next to it, but those soapdish-style sponge holders get filled with goo and the sponge doesn't dry. This beautiful holder holds it vertically, so the sponge dries right away, and looks pretty while doing it. The mixture of stones blends nicely with my granite counters. Worth every penny! You won't be disappointed! It would make a great housewarming gift! I have granite in my kitchen, so this looks great on the sink. The sponge can dry better with this. Sink and sponge are happy partners, and look oh so stylish! I saw the sea stone sponge holder in your catalog and suggested it to my son as a Christmas gift. It's different- people notice it - it's weighted so it doesn't move around or fall over, and I imagine it can be used in a number of different ways. My daughter saw it in my house and she is getting one for her birthday next week.